I got you covered on this as well with the help of xboxdrv! Although a little late to the party the Rasbian image initially did not have the xboxdrv library like Ubuntu users were so used to. As a result Raspberry Pi users had to go through the headaches of compiling it themselves or simply find an alternative such as a genetic joystick or bluetooth based joystick control provided they have a bluetooth style receiver. Note: This blog entry is a child blog off of the chinese xbox 360 receiver entry. If you stumbled upon this page first and have no idea what the hardware is be sure and check out that blog by clicking here. There is no drag and drop style method for any version of linux, you’ll have to be typing some commands to get it working. So the first thing you’ll want to do is plugin the xbox receiver into your Pi. on some other versions of linux such as ubuntu and Arch linux the dash may not be there. Lets first make sure out Pi is up to date with all of the libraries so we don’t get all crashy. That’s kind of crap. Your results may vary on this but this is what happens to me. 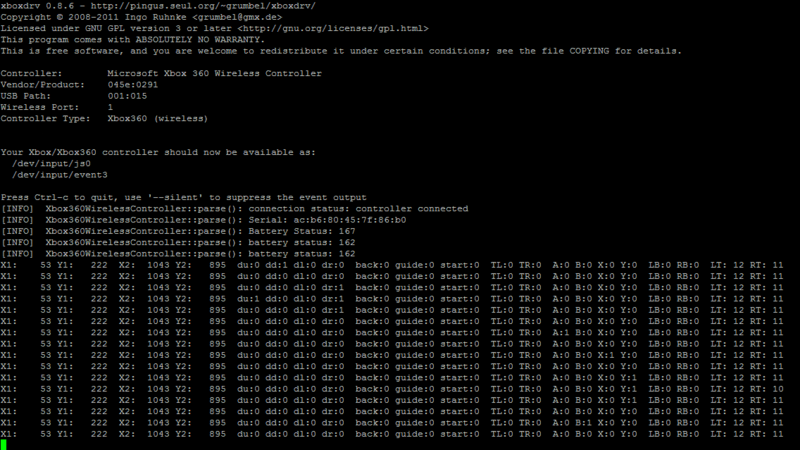 So the only solution thus-far is to begin compiling from the version 0.8.6 source which is right here. Next we use the git-core system to download our files, go into the xboxdrv folder, and compile the updated xboxdrv file which Raspbian does not have. please note: This can take up to an hour and a half to finish and will come up with lots of warnings about depreciated values for ARM if you are compiling this underneath Raspbian. If you are compiling on a regular PC you shouldn’t have these warnings and/or compile time. With Banana Pi’s version of Raspbian – /dev/uinput was not compiled into their kernel which makes compatibility of the wireless receiver just about useless. You can still run it with –no-uinput but the big problem is it will not create a /dev/input/js0 and thus will not invisible to everything but xboxdrv. The Raspberry Pi shouldn’t have this problem and perhaps the Ubuntu version of Banana Pi may not have this issue ether. But the Raspbian distro for Banana Pi is currently crap for the Xbox wireless receiver at the time of this posting. From here you get follow the PetRockBlog for more advanced scripting to auto-detect and assign player ID’s to each of your Xbox controllers in linux.